* Available only in Advanced connection mode. Note: If you want to set up WPA2-EAP or WAP/WAP2-EAP security, register your digital certificate file and place it on the SD card you will install in the projector. Select Network Configuration and press Enter ( ). 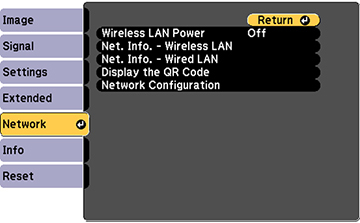 Select the Wireless LAN menu and press Enter ( ). Select the Security setting and press Enter ( ). Select the security settings for your network. When you finished, select Complete and follow the on-screen instructions to save your settings and exit the menus.